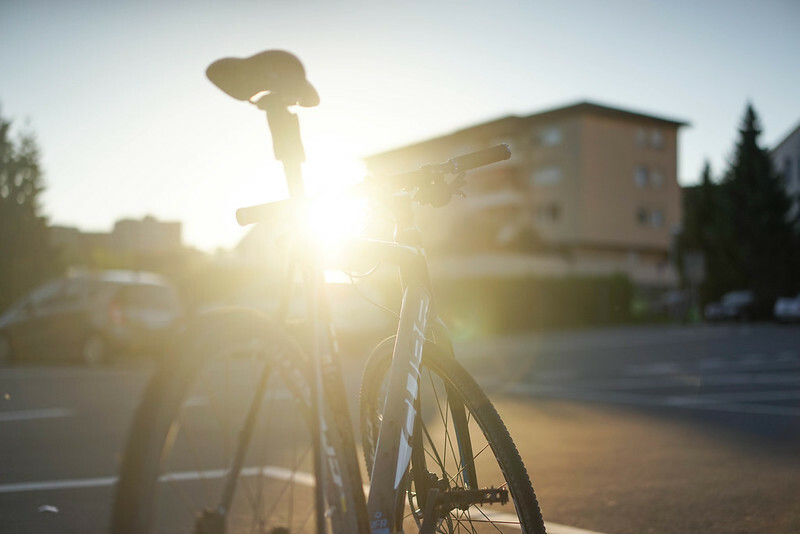 I have purchased the Cube Cross Disc bicycle second-hand back in 2014 as an ultimate do-it-all machine to replace somewhat petite BMC hybrid bike I had started cycling on. No other bike in my stable went through as many alterations as the venerable Cube, transitioning from an object of admiration to almost scrap and most recently getting resurrected to fulfill a pragmatic new purpose. It was the bike I rode during the legendary Rhine tour. Perhaps it is also the bike I’ve learned most of the bike mechanic skills on. Originally intended as a noble cause to minimize the number of bikes I own the project turned into an ugly obsession to combine the most exotic parts in a wild chase to build the perfect bike. Following the purchase I stripped the bike to the frame and rebuilt it with custom chosen components. Barely finishing the Rhine tour I went into another frenzy, adding and replacing a good chunk of parts again. A disaster happened one evening when I was fiddling with the bottom bracket. Being distracted by a conversation I have inadvertendly destroyed the thread where the bottom bracket is screwed in. 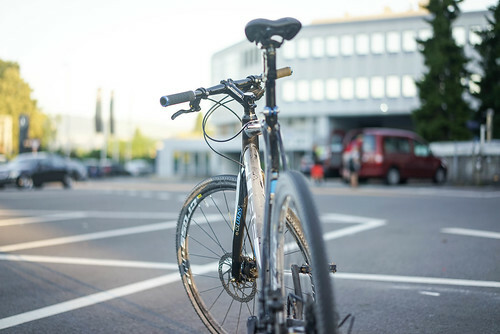 Very often that’s the death of the bike frame. And at the time I assumed the bike was gone. I took it apart and, eschewing the faux minimalism, purchased the marvelous Fargo touring bike and the BMC road bike I’m currently training on. The experience taught me a good lesson about minimalism. It is not always rational, nor cost effective, nor even meaningful. In pursuit of a do-it-all bike I’ve ruined the bike by squeezing too much into it. There were panniers… and aerobars. A lot of parts were installed simply because of hype. Months later, when I brought the destroyed frame to a local bike shop I didn’t expect the fatal mistake to get fixed. But it was! The mechanics were able to get the threads rechased. Not knowing what to do with the sudden fortune I left the frame to marinate in the cellar. Until one day it occurred to me that I have accumulated so many spare bike parts from all the upgrades and replacements that I could probably rebuild the Cube without purchasing much. I also didn’t have a city bike that could be left at train stations and public places without too much worry. With the priorities clear I decided to move forward with the rebuild. 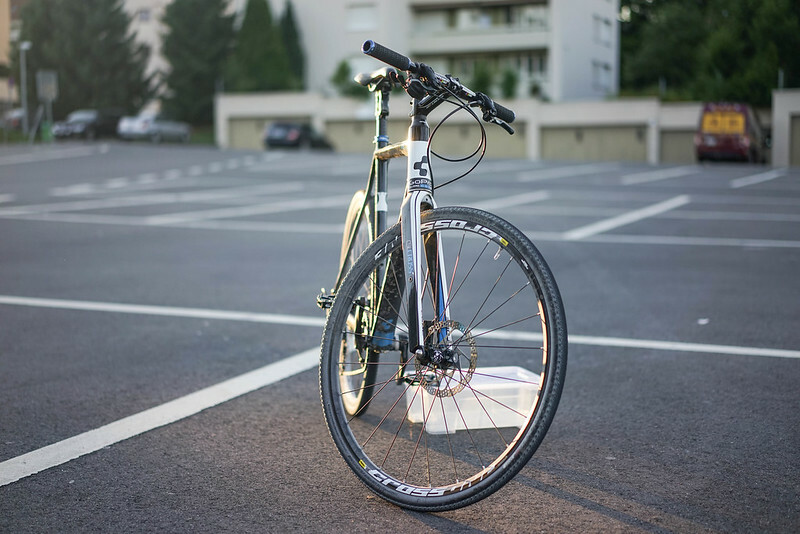 The priorities were: cheap (as few new parts as possible), disposable (no high-end components) and safe to leave. I am happy to report that I’ve been riding this workhorse for more than half a year. It is not sleek nor glitzy but it’s a pleasure to use everytime I’m off to the swimming pool or to run an errand. I would like to share a couple technical challenges along the way as well as few cool things I came across when putting it all together. Guided by the cost I built the drivetrain with a combination of Shimano Zee and Shimano XT components. This being an errand bike I chose to forego the front derailleur and use 10 speeds in the rear for simplicity’s sake. The gear range was nicely extended by a spare Wolf Tooth Components 42t sprocket I had. That’s how many of the components ended up on the bike - I simply had them already. The 1x10 system didn’t work flawlessly though and I have done lots of small changes to make the chain slide smoothly. 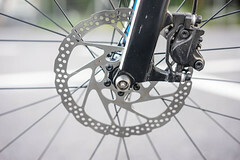 The underlying issue was the chainline – the chain was too skewed in the largest rear sprocket. One could feel the tension. 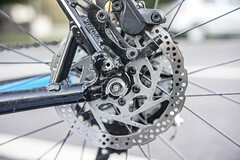 The front sprocket sat too far from the middle, relative to the cassette. That meant that smallest sprockets worked well but anything in the upper middle didn’t. Getting the chainline right took many iterations. At first I moved the bottom bracket spacers from the drive side to non-drive side. A free and noticeable improvement. Next, I have replaced a part of the Shimano XT derailleur with something called a GoatLink. I am not completely sure it made a big difference. 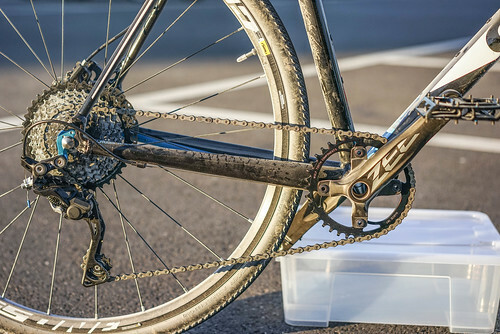 The derailleur itself is quite important for the 1x10 drivetrains – it should be equipped with a clutch mechanism. 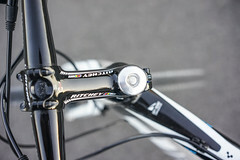 I’m personally using Shimano RD-M786. The final step was to install chainring spacers. That required longer chainring bolts and appropriate spacers. I found it somewhat difficult to track these parts. I found the fitting bolts on CRC although their original purpose seems different: Race Face Poly Bashguard Fastener Bolt Kit. The spacers must have inner diameter of 10mm. I found those at OneUp. Most recently I replaced the stock 36t Zee chainring with a 38t one. All in all, it works well enough now. I look forward to a time when internal gearboxes, such as the brilliant pinion, become more widespread and affordable. Head past to the photo gallery.